Network Attached Storage (NAS) Market size is set to exceed USD 20 billion by 2024; according to a new research report by Global Market Insights, Inc. The NAS market growth is attributed to the increasing adoption of the storage technology by SMEs for extended and scalable storage applications along with the growing demand for NAS systems from the home/consumer market. Also, features such as ease-of-installation and automatic backup capabilities are further contributing to the rising demand for NAS solutions. The proliferation of social media content and the growing popularity of on-demand entertainment services are also expected to contribute to the increasing demand for the storage technology from the home/consumer sector. For these applications, the NAS systems are being used as home backup devices, mail servers, media streamers, and video surveillance recorders. The traditional architecture segment held a major share of the NAS market in 2017 due to the large-scale utilization of legacy scale-up systems for storage functions by enterprises. However, with the growing popularity of scale-out NAS systems for affordable and less complex network storage, the scale-out architecture market is expected to exhibit accelerated growth between 2018 and 2024. As scale-out systems efficiently support High-Performance Computing (HPC) applications as compared to scale-up architecture in terms of reduced hardware cost for procuring additional data storage resources, the demand for scale-up NAS systems is expected to exponentially increase over the forecast period. 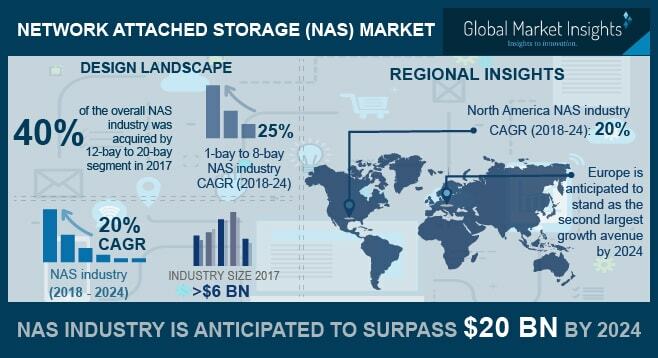 The 1-bay to 8-bay NAS market is projected to register high growth over the forecast period wit a CAGR of over 25% due to the growing popularity of the storage technology for home-based consumer applications. With increasing multimedia data being generated from consumer mobile devices, home entertainment systems and smart IoT devices used for home automation purposes, the storage needs of the consumers are expected to increase consistently over the next five years. Consequently, manufacturers are focusing on introducing NAS solutions that are designed to address the specific storage requirements for these consumer-level applications. Due to the growing adoption of cloud platforms for storing enterprise data in a flexible and dynamically scalable architecture, the cloud deployment segment is projected to register an accelerated growth in network attached storage market with a CAGR of around 24% between 2018 and 2024. The businesses that require a powerful, agile, and frictionless storage, can benefit from cloud-based NAS solutions while reducing their data storage costs incurred from the procurement of on-premise storage infrastructure. Hybrid deployment is projected to register the fastest growth deployment model segment in network attached storage market during the forecast period as it allows users to store critical data on-premise while leveraging scalable cloud-based storage platform to accommodate dynamic storage requirements. With increasing emphasis on digitalization in the healthcare sector, the adoption of healthcare management systems is increasing steadily in the developed as well as the developing economies. This has resulted in the growing demand for efficient network storage solutions from the healthcare sector. Growing popularity of advanced systems such as electronic medical records will further contribute to the adoption of network attached storage market in the healthcare industry leading to a robust growth with a CAGR of over 20% during the forecast period. North America is projected to hold a major share of the NAS market throughout the forecast timeline due to the early adoption of the advanced storage technology by enterprises in the U.S. With the large-scale adoption of cloud platforms by enterprises in the region, cloud-based and hybrid NAS solutions are expected to garner a high demand over the forecast period. Europe is projected to be the second largest network attached storage market by 2024 due to a growing data center ecosystem in the region along with large-scale adoption of the storage technology by SMEs. As the major global players are aggressively extending their presence in the European market through distribution agreements with local companies, the adoption of NAS systems is likely to increase steadily between 2018 and 2024. The companies operating in the network attached storage market are involved in aggressively expanding their global presence by introducing their products in untapped regional markets by partnering with local online and offline distribution channels. The companies are also focusing on diversifying their product portfolio by introducing NAS systems that are tailor-made for SMBs and home & enterprise customers. Some of the key players operating in the NAS market are Netgear, Buffalo Americas, QNAP, Western digital, Thecus Technology, Hitachi Data Systems Corporation, Synology, DELL EMC, Seagate, D-Link, NetApp, Zyxel, SoftNas, Avere Systems, Asustor, Infortrend, Pansas, Broadberry, and Cisco.